I had the very distinct pleasure this morning of enjoying a long breakfast and enlightening conversation with my very dear friend and electronic engineering mentor, Mr. Ed Bigbie. Ed is well known in the Amateur Radio community by his callsign, W4MMQ. He is an Extra Class license holder and received his first license in 1946. Actually his amateur radio license is probably the least of his credentials. He is a registered professional electronics engineer, a FCC licensed First Class Broadcast Engineer and a member of the IEEE, among many other fine distinctions. He is the retired owner of Savannah Communications in Garden City. The family-owned company is now run by his talented son Don Bigbie. One day I will write more about Mr. Ed’s vast experiences in radio and television and his many contributions to Savannah, GA broadcasting but that will have to wait for now. This conversation is one of several recently where Mr. Ed and I discussed his past venture in the design and building of a premium balanced antenna matching unit that he built and sold beginning in about 1996. Antennas and antenna matching has become one of our favorite discussion topics. Ed knows a lot about many technical topics but he is especially knowledgeable about antenna matching. So, after we ordered our toast and omelets and overpriced espresso coffee drinks we settled into a quite corner at Scoops coffee shop in Richmond Hill. I’d picked Ed up at his home a few minutes earlier and noticed he was clutching a brown manila envelope and a 1967 World Radio Laboratory catalog. My good manners prevented me from blurting out, "What’s in the envelope” before he was ready to share but I knew he had brought along something special – as he so often did. First he gently turned the pages of a perfect specimen of an 1967 WRL amateur radio catalog. Those of you old enough to remember WRL already know what this was like -- really nothing to compare with a present day Ham Radio Outlet catalog or an AES catalog. The first apparent difference was that everything on every page was manufactured in the United States! Even today I still drool over those fine Hammerland receivers, radios by Hallicrafters and R.L. Drake and Collins. It was a pleasant trip down memory lane back to the time I was a young boy and looked at this same catalog! Next Ed opened the envelope and began to take out pictures, one by one. 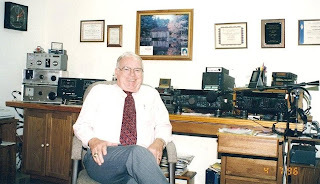 The first image was of a somewhat younger Ed; in 1996 in his very well appointed amateur station in Helen, GA. You can be sure that Ed either owned, or previously owned any piece of amateur radio equipment that he has ever wanted. In this particular picture I saw what looked like the most recent Icom premium amateur radio transceiver. Over his left shoulder I could make out an ETO linear amplifier which alone cost more than the sum total of all the amateur radio equipment I have ever owned! Just to the left of the ETO was a stack of three very rugged looking boxes that were the subject of this conversation. The one on the bottom was the prototype of a very professionally finished balanced antenna matching units that Ed had designed and built. It seems that Ed was also a longtime friend with Walt Maxwell (W2DU) – maker of the famous “true current balun” Walt was an engineer with RCA at the RCA Space Lab. There, while he had access to his employer’s very well equipped RF testing facility, he begin to experiment on a new antenna matching unit. Ed told of his visits with Walt at the RCA Antenna Lab and test range in March 1970. W2DU, for whatever reason, never had any commercial aspirations for bringing his “new” tuner to the market so as time passed his design notes lay filed away. But Ed was quick to recognize the classic simplicity and value of W2DU’s simple tuner and if Walt wasn’t going to build them then Ed resolved that he would. So using two rugged 28uH roller inductors and a massive 3.5 kV variable capacitor Ed constructed his prototype W4MMQ Balanced Matching Unit. He labeled it serial number 1. (You can read Ed’s construction notes elsewhere on this blog). That unit is still in service today, says Ed. “AD4RO (William B. Greer) has it. It’s on the air every morning up in Johnson City Tennessee”. It is important to remember that these are balanced line tuners. There is no provision for a coaxial output. Because they tune a balanced line, there are two identical roller inductors mounted side by side. The one of the left is driven by a rugged crank reminiscent of those I’ve seen on AM broadcast transmitters. The second parallel roller inductor, mounted just a couple of inches to the right of the first inductor is driven with a special cogged belt so that one crank on the front panel drivers both inductors. But these tuners were not meant to be decorated with lots of bells and whistles, they were meant to run day in and out, handle high power and whatever antenna mismatch most anyone would ever encounter. Over the next few years Ed and his friend Gene Rhodes of Deland, Fl manufactured quite a number of these “built like a tank” antenna matching units (please don’t call it a tuner, Ed corrected). And being the kind and generous man that he was, they are all in the homes of other hams. He never kept one for himself. After about the third refill on coffee (Ed did not drink coffee which may account, in part, for his excellent health and longevity) I expressed an interest in documenting and publishing the construction details and even envisioned that he might lead the Coastal Amateur Radio Society club members in a group construction project. Ed must have anticipated my interest because he then presented me with the remaining contents of the manila envelop which contained his hand drawn schematic, a typewritten essay and a fist full of photographs of the tuner from all angles. I’ve published his work elsewhere on this blog for all to enjoy. Some months later I heard Ed mention that he had been contacted by a number of amateur operators from all over the world seeking information about building their own tuner from his notes. I could tell that this pleased Ed very much and I was glad that I’d helped to bring him just a small bit of recognition for his efforts. The breakfast crowd had long cleared from Scoops. A few people we both knew drifted over to our table to greet Mr. Ed. Unrushed, we both got up and I drove slowly back to Strathy Hall savoring every moment of our conversation and not wanting the visit to end. It was a Friday – my day off from the office. I parked in Ed’s driveway where we continued to sit and talk for the longest time. Our conversations would frequently drift to discussions of broadcasting and RF engineering which I enjoy most. It was that shared interest in broadcasting, particularly AM broadcasting, that first brought Ed and I together sitting in a booth at Captain Joe’s Restaurant down in Midway, GA in 1980 when he made a cold-call on Coastal Electric offering his company's services to maintain our newly purchased Motorola radio system. Interestedly much of that equipment is still on the air, 29 years later, and we've never signed a subsequent agreement. With Ed it was possible to conduct business solely on a handshake. We never had any problems but we knew that if we did it would be Ed's integrity that would resolve the conflict, not words in a contract. I don't know of anyone else right now that I would trust to that same extent. Finally, we wound down and parted company. I returned home feeling enriched and enlightened once more from another memorable conversation with Ed Bigbie. 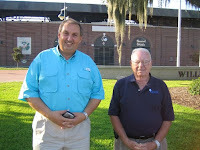 It was with much sadness today that I learned of the passing of Mr. Ed Bigbie (W4MMQ) of Richmond Hill, GA.
Ed was a very kind and generous man and he was a best friend and mentor to me in the field of amateur radio and electronics for the 29 years that I have known him. Ed Bigbie received his Amateur License in 1946. 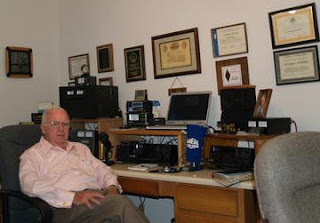 He has been a member of ARRL since 1946 and QCWA since 1975. He received his First Class Phone License with Radar Endorsement in 1945 and has been an ARRL Technical Specialist since 1996. Ed was a Senior Member of the Institute of Radio Engineers (IRE) until it merged with The American Institute of Electrical Engineers (AIEE) and became the Institute of Electrical and Electronics Engineers (IEEE). Ed was a Senior member of IEEE and a Senior Member of The Society of Broadcast Engineers (SBE). He was also a charter member of the Association of Communication Technicians (ACT). Ed had been a Registered Professional Engineer (PE) in the State of Georgia since 1965 and authored several articles on antennas, transmission lines and matching units. You could frequently find him on 3.995 early every morning where he put out a "broadcast quality" signal from two IC-756 PROIII's, a IC-PW1 amplifier and an 811H amplifier.